More Good News: Outside observers are traveling to the Dakota Access Pipeline protests in North Dakota to monitor the situation and bring some accountability for the harsh military tactics used against the Water Protectors. The United Nations Permanent Forum on Indigenous Issues is investigating alleged human rights abuses against those peacefully opposing the pipeline, according to a story in the Guardian newspaper. Amnesty International USA also reports that it will monitor the situation. According to the story in the Guardian, an investigator from the UN Permanent Forum on Indigenous Issues has been collecting testimony from pipeline protesters, “who have raised concerns about excessive force, unlawful arrests and mistreatment in jail where some activists have been held in cages. Jailed protesters said it seemed clear that police weren’t prepared to handle hundreds of people at once in their local correctional facilities. A day after their release, many still had numbers and charges written on their arms in marker – which advocates said was an unusual and dehumanizing way for police to track inmates – and some were temporarily kept in cages that they said felt like “dog kennels”. The Guardian was told Morton County had “nothing to hide” but a reporter was later denied access to see the jail conditions. Here is the photo sent by the Morton County Sheriff’s Department of the temporary holding cells used. Those jailed compared the cells to dog kennels. An earlier Guardian story — Dakota Access pipeline: Native Americans allege cruel treatment — said those arrested were subject to invasive body searches. We would like to remind you that the decision to disperse an assembly should be taken in line with the principles of necessity and proportionality, and only when there are no other means available to protect public order from an imminent risk of violence. Where a small minority tries to turn a peaceful assembly into a violent one, law enforcement officials should protect the peaceful protesters and not use the violent acts of a few as a pretext to restrict or impede the exercise of the rights of a majority. When a lawful decision has been taken to disperse an assembly, the order to disperse must be clearly communicated and explained to obtain, as far as possible, the understanding and compliance of the demonstrators. Sufficient time must be given to disperse. Amnesty also will call on the Department of Justice to investigate police practices, the organization said. 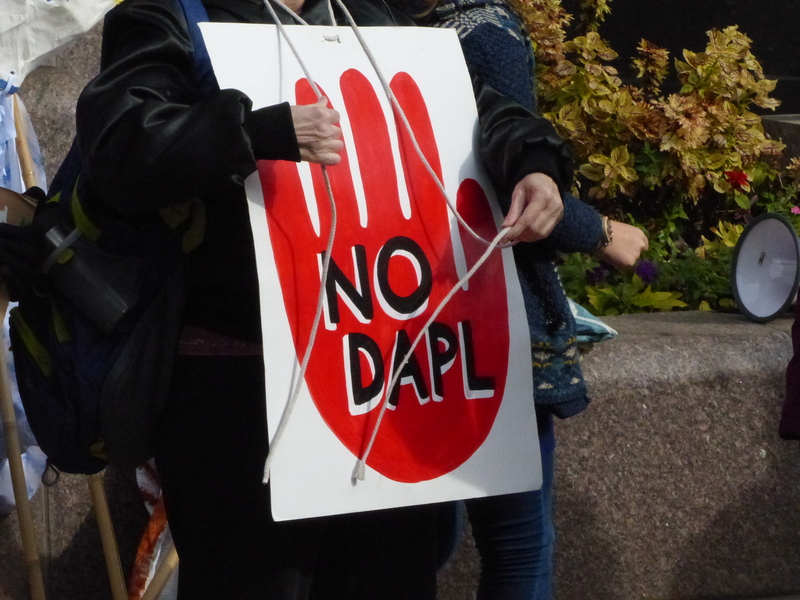 Six environmental and legal advocacy groups are putting the owners of the Dakota Access Pipeline on notice that they could be legally liable for human rights abuses, even when the actions are taken by law enforcement on their behalf. At a minimum, it would seem that those funding the pipeline could be facing a long court battle over these issues. As a matter of international law, your companies have an affirmative responsibility to protect human rights, including the responsibility to: avoid causing or contributing to adverse human rights impacts to peaceful protestors through your companies’ own activities; and to seek to prevent or mitigate adverse human rights impacts that are directly linked to your companies’ operations. These responsibilities also apply to banks and other institutions that provide financing for a project that will cause such adverse human rights impacts. We emphasize and caution that the active involvement by persons acting under color of governmental authority, including state or local law enforcement, does not absolve your companies of these duties. To the extent that human rights abuses occur, business enterprises have an affirmative duty to avoid complicity in those abuses. Your companies may be responsible for injuries or losses suffered by the protestors, including those caused by private security forces or police working in concert with you or at your behest.